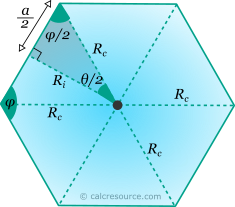 This tool calculates the basic geometric properties of a regular hexagon. Regular polygons are equilateral (all sides equal). 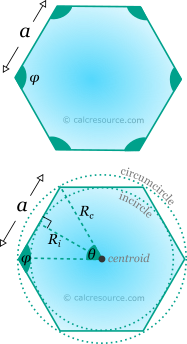 The tool can calculate the properties of the hexagon, given the length of its sides, or the inradius or the circumradius. Enter below the shape dimensions. The calculated results will have the same units as your input. Please use consistent units for any input. Hexagon is a polygon with six sides and six vertices. A hexagon is regular when all its sides are equal. The interior angles of a regular hexagon are always 120°. For any regular polygon, a circle that passes through all vertices can be drawn. That is the cirmuscribed circle or circumcircle of the polygon. Also, a circle that is tangent to all sides can be drawn, which is called inscribed circle or incircle. NOTE: Some of the above formulas have general scope for all regular polygons. These are the formulas, with θ, φ or N variables, not substituted with specific values.